BsnTech Networks received an inquiry from Shan at Women’s Peak Performance Coaching. She wanted to get a clean and professional site designed for her coaching practice. Upon receiving the information from Shan, we had the initial site up within two days. A few changes and modifications then took place over a couple more days until she has now approved of the website. We appreciate the business from Shan and hope that she has found our website design services a great value for her needs! 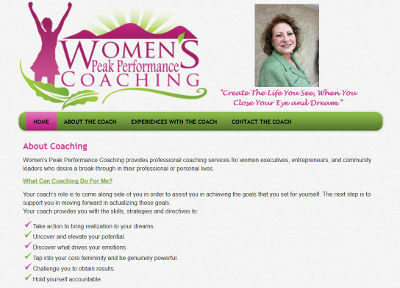 Shan’s website is at womenspeakperformancecoaching.com. Website Design For Glez Builders, LLC.